The evolution of home theater now sees system configurations starting at 7.1.2 and peaking with as many as 32 discrete channels. Do all these channels mean it’s time to change overall amp designs to match these configurations? Regardless of whether it is a retrofit environment like this picture that features an Aerial Acoustics floorstanding speaker and Atlantic Technology Dolby Atmos speaker, the number of channels in home theaters are increasing due to the popularity of immersive audio formats. A few years ago, audio giant Dolby brought its object-based surround sound format—Atmos—from the commercial market to the residential consumer market, and it hasn’t looked back. Today, Atmos, along with competitor formats DTS:X and Auro-3D is thriving in the consumer electronics industry. Object-based surround (or immersive sound) has been so successful that price or the number of speakers are no longer barriers. Integrators can assemble budget-friendly systems that are just as impressive as high-end expensive systems, and the content community is responding with UltraHD 4K discs with HDR to rival the quality of the best commercial cinemas. Perhaps the only problem with the rapid adoption of immersive audio is the fact that amp manufacturers haven’t kept pace. Sure, many of them offer home theater processors that incorporate as many as 32 channels and the latest in equalization (EQ) software, but where are the amps to support all these channels? For comparison purposes, just about every A/V receiver company provides a choice of receivers with a minimum of 5.2.2 configuration capabilities to accommodate immersive audio. Transitioning from receivers into separators can severely limit integrators and their approach to amplification. With more homes gravitating towards system configurations that are at least 5.2.4, 7.2.2 or 7.2.4, the need for streamlined amplification is at an all-time high. High-performance companies such as Bryston, Meridian, Lexicon, McIntosh offer amps ranging from five to seven channels. For object-based surround applications, that means a bigger financial commitment from consumers and a massive increase in rack space and weight to accommodate multiple amps. Similarly, the commercial audio industry tends to top out at about four channels. These amps are just as powerful, more rack-friendly, and arguably more robust due to the critical applications in which they are deployed, but like the consumer products, integrators will need to use two or three amps to power advanced speaker configurations. Another possibility is the use of whole-house audio amps. There are some terrific products in this category, including AudioControl’s Architect Model 2660 and Director Model D4600, as well as Audio Design Associates’ (ADA) SAK-16150, and Lexicon’s DD-8+, but these products aren’t specifically engineered for the demands of a home theater. Moreover, in some cases, integrators may have to use a second amp in large, advanced systems. Asking Gary Dayton, vice president of sales for Bryston, Ltd., about the increasing need for more amp channels, he admits there is some pressure for a company like Bryston to develop amps with more channels, but he says Bryston will always favor performance over convenience. “I think to some degree there is some pressure to do that, but with home theater installations there is always a spectrum of inexpensive and convenient products that pack as many features into a single box as possible,” he says. Dayton points out that Bryston has already begun work to meet the demands of more channels by introducing new products such as two asymmetrical amplifiers. He explains the two new amps feature 1,000-watt and 600-watt monoblock channels, all the way down to 8 x 75-watt configurations. “We got two new multichannel amplifiers that are asymmetrical in their ratings. One such model is the 24B, which features two 300 watt channels, plus four 75 watt channels so that lets you front load power ratings for your loudspeakers to maybe take advantage of larger loudspeakers or lower sensitivity speakers in the front while having extra channels available for surround and in-ceiling,” he notes. Commenting on more cost-and rack-friendly amplifier technologies like switch-mode power supplies, Dayton adds that Bryston will never rule the technology out, but as it stands now, the company doesn’t feel those technologies perform well enough for Bryston to implement into its products. Going forward, amplifier manufacturers will need to realize that they may lose sales to A/V receiver companies due to the cost and convenience those products provide. A case could be made that if the Class D or switch-mode power supply amps are good enough for front-of-house (FOH) engineers in live settings across the world, they should be good enough for the less educated ears of homeowners. Ultimately, it could be custom electronics professionals that decide the fate of amp companies in home theater environments. There will be no issues if integrators specify separate components—multiple amps and home theater processors as immersive audio continues to grow, but if integrators (often through client pressure) decide the cost, convenience and ergonomics of A/V receivers are the best solutions for immersive audio then amp companies will have major problems. Distributed audio amplifiers don’t necessarily have the transient power reserves as theater amps, which is why a commercial amp like the Crown DCI repurposed with JBL Synthesis SDA has to have more peak power output (300WPC for example). However, if you’re using a Sonance Reference series speaker the DSP 8-130 is a good match. 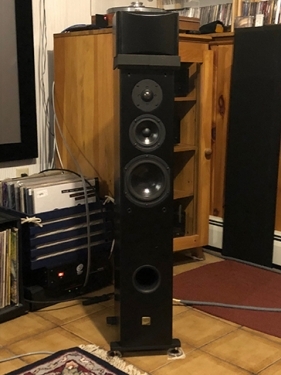 Two of those will give you 16 channels 130WPC in 2RU with DSP specifically for the Sonance speakers with enough headroom to work as a theater amplifier. I’m more wary of the Lexicon DD-8 or the Meridian 258 in home theater, though the 1RU per 8 channels is very tempting to try out in smaller media rooms where you won’t need high power amplifiers.